Is taking your companion animal along best for your companion animal, or best for you? At home your companion animal has all of his/her favorite toys, sleeping spots, and perhaps the run of the backyard all day. Will he accept being cooped up in a car for several days? Early acclimation to automobile travel is the key. If your animal would rather get into the car with you, even to go to the grocery store, than stay home, she is a good traveler. If motion sickness is a problem, for short trips, just don't feed right before a ride. 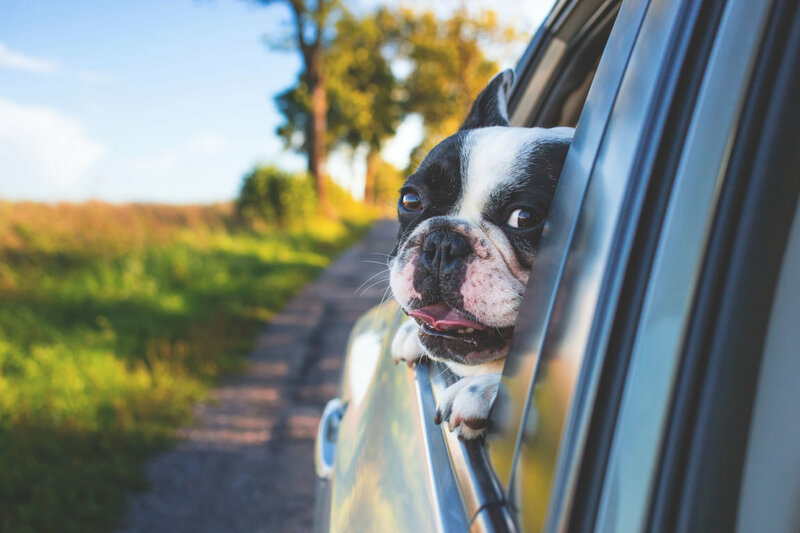 Animals that very infrequently ride in a car are poor candidates for automobile vacations. Some companion animals shouldn't travel at all. If your companion animal is very young or very old, sick, recovering from surgery, or pregnant, then leave her at home. Other companion animals do not do well on airplanes, such as cats, older animals, hyperactive dogs, and short-muzzled dogs who may have difficulty breathing in a cargo hold. You may be able to persuade a friend or relative to watch your companion animal. If not, a professional companion animal sitter will come into your home once or twice a day to take care of your companion animal, or stay in your home while you are away. They will walk your companion animal, play with him, feed him, and clean up after him. Most will even pick up your mail, and turn lights on at night. Before hiring, interview the companion animal sitter in your home so you can see how they and your companion animal get along. Interview them as if he or she were a day care provider for your child. Discuss your companion animal's needs, habits, and personality. Ask such questions as: What was your worst companion animal-sitting experience? If my companion animal gets loose, what will you do? Make sure they are bonded and insured. Get references and call those references. If you do hire a companion animal sitter, before you go on your vacation, be sure to leave: detailed written instructions on your animal's care and feeding habits; your complete itinerary, including telephone numbers of where you can be reached; the name and phone number of your veterinarian. You may also want to notify your veterinarian, and leave a credit card number for emergencies, especially for older animals or for animals on medication. To locate a professional companion animal sitter, get a reference from your veterinarian or animal welfare group. Do you want to board your companion animal? Then visit the kennel beforehand. Make sure you inspect it personally to satisfy yourself that it is clean, safe, and roomy enough for your companion animal. If it's chain link, check for loose wires and edges that can cause cuts. The staff should be friendly. Veterinary care must be easily available; in fact, many veterinarians offer boarding facilities. Are vaccinations required? Animals should be checked at least four times a day, fed twice, and dogs walked at least twice. How many hours are animals left unattended, especially at night? Medication and special diets, if they are needed, must be accommodated. Make a reservation well ahead, especailly for holiday or summer travel. If you bring your companion animal's favorite toy to the kennel, make sure it goes with your animal. Often, kennels will take your "special" toy and promise to provide it and will then put it in on a shelf until you come back. Make sure there is a laundry for bedding. Can a friend visit your companion animal? Will your companion animal have access to a run? Is the kennel air-conditioned or heated? Some kennels arrange "playmates" for non-aggressive dogs so that two dogs may play together for an hour or so each day. If you plan to board your cat, make sure that the cages are tall and supply different levels for your cat to climb and sit. There are other facilities in the area. Don't be afraid to take your business elsewhere if there is anything you don't like about this one. If you do plan to take your companion animal along with you, make sure your animal is properly trained to sit, stay and come. No matter what transportation you choose, your companion animal should wear a collar, license, and proper identification at all times. The identification tags should have your companion animal's name, your name, address and telephone number on it. If there is room also add the name and telephone number of a person who could serve as an emergency contact in case your companion animal is lost. Consider having your animal microchipped at the vet's; this is a painless process that inserts a uniquely-coded microchip, usually under the skin between your animal's shoulders, which contains all the information i.d. tags would carry. A nylon collar or harness is best for either a cat or a dog. Never allow your companion animal to travel wearing a choke-chain. The collar-pull could become snagged on the carrier or other object and he/she may choke to death. A cat must wear a safety stretch collar to prevent getting hung up on hooks, branches or other protruding objects. Keep handy your companion animal's shot records, a written description and several photos of your animal in case she becomes lost. You will need these to claim your companion animal from the local animal control center when they find her. The written description should include your animal's name, height, weight, color and any distinguishing marks. Also take along a leash, a supply of your companion animal's usual food, a container of water, dishes for food and water, a litter box for cats, a favorite toy or two, flea control products if desired, a brush and clippers, any medication your animal may need, and an emergency first-aid kit in case of injury. As soon as you know your companion animal is vacationing with you, see your veterinarian. Have your vet check your animal's general fitness and ability to travel. Are your companion animal's immunizations current? A health certificate is required by law for interstate travel (although most people ignore this if traveling by car). If you fly, most airlines will require a vet's health certificate for your animal anyway. Get a copy of your companion animal's immunization record. Most states and other countries require that your cat or dog have current rabies shots and may require other types of immunizations. If heartworms are a problem where you are going, get the necessary heartworm medication if a long stay is planned. Otherwise, a heartworm test scheduled according to the laboratory recommendations is sufficient. If you are going to a tick-infested area, get your companion animal vaccinated for Lyme disease, and be prepared with a topical tick and flea repellant such as "Frontline." If your animal is prone to motion sickness, your vet can prescribe proper medication. If you'll be at your vacation spot more than just a few days, find the nearest veterinarian's office and emergency veterinary clinic. Knowing where to go if problems arise will make it easier on everyone. Traveling by plane may be the most expedient way to travel, but it may also be the hardest on your companion. It places you in a situation where you have little control over the care given to your animal. Although federal regulations require that animals transported on airlines be treated humanely, there have been occasional infractions resulting in injury or death of the animals. Many airlines allow small dogs and cats in appropriate carriers to be brought into the cabin and placed under the seat. Soft-sided carriers are best for this purpose, although flip-top hard cases are also allowed. If your animal companion is small enough, this option permits you greater control and access, and it is far safer for your animals than traveling as cargo in the baggage hold of the aircraft. If your animal companion must be shipped as cargo, there are several ways to minimize the risks. Travel in off-season periods at mid-week, during the day or late evening, to ensure that your animal receives better care from the baggage handlers (there will be less baggage to handle). Also there is less chance that your flight will be delayed on the runway. Never travel with an animal when outside temperatures reach above 80 degrees or below 40 degrees. You don't want to fly to Houston during a summer's day when temperatures can soar to over 100 degrees. All airlines and most states' health officials require health certificates for your companion animal. These certificates may be obtained from your veterinarian, who must examine your companion animal within ten days of departure. Most airlines will try to help you select the right flights and advise you about scheduling. Don't panic. Most animals who fly, do just fine. Plan carefully and your trip will be successful for your companion animal. Companion animal carriers must meet minimum legal standards for size, strength, sanitation, and ventilation. The animal must have enough room to breathe, stand up, lie down, and turn around comfortably. The carrier must have handles, a food dish and water dish, and should be labeled with your animal's name, your name, address and destination. For extended trips you should also affix food and medication to the top of the carrier. Stickers reading "Live Animal" are required on the top and one side. The sticker on the side should have an arrow pointing to the top of the carrier. The best carrier is made out of hard plastic with a steel or plastic mesh door. A lip on the side will keep any baggage pressed up against it from blocking the ventilation holes. Make sure the door-locking mechanism is easy to use. Tighten all bolts before travel. Make sure the lock or fastener on the door of your companion animal's carrier is easy to open. In an emergency, the baggage handlers may need immediate access to your animal. Water and food dishes must be accessible from the outside for feeding and watering. Some companion animal guardians freeze water in a dish before flight. While this might provide your companion with water, once the water melts it can spill over into the carrier bed, making for a very wet ride for your animal. Don't feed your companion for at least six hours before departure time. Most companion animals travel better on an empty stomach, and if they do get sick they will not soil themselves. Using a spray such as Feliway or Rescue Remedy on the carrier before placing a cat in it may help reduce stress. Never muzzle your companion animal - it could restrict her breathing and limit her ability to pant. Put her favorite blanket or toy in the carrier before leaving for the airport. Arrive at the airport at least an hour (no sooner than four hours) before your departure time. This will give you time to service your companion animal, take him for a quick walk and a chance to eliminate if he needs to. Be sure to pick up the remains. Once you reach your destination and have deplaned, immediately retrieve your companion animal from the baggage claim area. A few safety procedures are vital when traveling by car. Never, ever leave your dog unattended in a hot car. Your companion can suffer irreparable brain damage or death if left in a car on a hot day - even 10 minutes may be too long. Do not let your dog hang her head outside the window. This may be an icon of Americana travel, but dust and debris can easily lodge in delicate eyes. Pet supply stores stock special restraint devices that secure your animal to the seatbelt buckle or to the seatbelt itself. If you are involved in an automobile accident, the restraining device will keep your companion from crashing into the front window or car seat. The restraint will also keep your animal inside the vehicle and away from the driver. If you're traveling by pickup truck, many states require your dog be tethered if he travels in the cargo bed. (Some states require dogs ride in the cab with you.) Regardless of the law, any animal riding in the bed of a truck should not just be tethered but "cross-tied" so that falling or leaping over the side is impossible. Be sure to learn the law in the state you're visiting. At present, Amtrak does not allow companion animals to travel on its trains. Some commuter trains and smaller train operations may allow a companion animal to travel in the baggage car in a carrier (the same carriers that the airlines require). Check with your local railroad to verify that it allows companion animals on board. Also find out if its baggage cars are air-conditioned or heated (most are not). If not, consider another form of transportation or avoid train travel in extreme weather conditions. If your train has a long stopover, retrieve your companion animal from the carrier and take her for a walk. Unless your animal is a service animal, bus lines do not allow animals on board. However, local transit systems may allow muzzled and leashed, or crated, animals on board during non-peak hours. Before making any decisions, check with your local transit authority first. If you are vacationing on your boat, remember to treat your companion animal as if he were a child. This means putting a flotation vest on your companion. While dogs are natural swimmers, they can tire easily and may drown before they reach the shore. It also means not letting your animal stand on the bow of boat where a sudden shift may throw the animal into the water - if you are lucky it will throw your companion clear of the boat and its propellers. Above all, do not let your companion ride in a boat while it is being towed. Some cruise liners will allow companion animals to travel in special holds but prohibit them from passenger cabins. If your cruise liner visits a foreign country or Hawaii, quarantine laws may require your companion to be confined from two weeks to six months. An animal in quarantine is boarded at your own expense. If you cannot reliably control your animal, he has no place camping with you. Many camping trips have been ruined because a usually calm companion turned into a barking, overexcited animal full of wanderlust. Any companion animal you take into the wilderness must know how to instantly sit, stay, heel, and come on command, for her own safety as well as yours. However, taking a dog along on a hiking trip has allowed many women and men to backpack solo. Most dogs are capable of carrying a backpack that weighs up to a third of their own weight. Dogs are prone to agitate bears and have been known to lead them into campgrounds. If you plan to go camping in bear country, best leave your dog at home. In any case, do not let your dog wander. Many campgrounds require all dogs to be on a leash, so do not take along your dog if she is not leash trained. Generally, dogs are permitted in state and national parks if leashed. Regional offices of the National Parks Service and state parks departments can tell you which parks allow animals and under what conditions. Some parks may allow companion animals in the campgrounds or in the lodges but prohibit them from trails. Dogs can scare away wildlife and should be discouraged from barking, especially at night or when hiking in the wilderness. If you do camp with your dog, make sure you have purchased his normal food beforehand. Do not wait and purchase your dog's food at the camp store. The combination of unfamiliar food, environment, and water may upset your dog's digestive process. Be sure you take along containers for food, a leash, flea and tick powder, a dog comb, a first aid kit and water. Several hotel chains allow vacationers to take companion animals into their room. These include Days Inn, Budget Inn, Quality Inn, Best Western, Clarion, Hilton, Marriott, Motel 6, Residence Inn, Ramada Inn and Sheraton. Since each hotel chain may have different restrictions, and individual hotels within the chains may have different policies, call ahead to the hotel itself to ask about requirements. If the unthinkable happens and your companion animal runs away, don't panic! Contact the local animal control shelter and humane society and provide them a current photograph of your companion animal. Post reward signs that feature a photocopied picture of your companion animal, your hotel telephone number, and the number of someone who will take messages for you. Give the local police a description of your companion. They may be willing to keep an eye out for your animal while on patrol. Place an ad in the local newspaper with your hotel number and the number of a friend or relative. If you cannot stay in the area, give your home address and telephone number to the local shelter, humane society, and the hotel where you stayed in case your companion animal is found. If a companion animal is found, it is usually within four to six days.